City of Hamilton staff member Angela Storey (Manager of Business and Support Services in the Operations & Waste Management Division) confirms that “there is nothing in the solid waste or yard maintenance by-laws that would prevent composting of pet waste” in accordance with the bylaws listed below. (v) kept in a rear yard located against a building, structure, fence or retaining wall and arranged in an orderly manner. A copy of by-law 10-118 can be found on the city of Hamilton website under 2010 by-laws (http://www.hamilton.ca/CityDepartments/CorporateServices/Clerks/By-Laws/By-laws+Passed+in+2010.htm ). A copy of by-law 09-067 can be found on the city of Hamilton website under 2009 by-laws (http://www.hamilton.ca/CityDepartments/CorporateServices/Clerks/By-Laws/By-laws+Passed+in+2009.htm). Pet excrement contributes approximately 12,000-30,000 pounds of waste to Hamilton landfills every year. Composting the waste from one medium sized dog eliminates about 122 pounds of this each year. Imagine the difference we could make if every pet owner used one of these…. Using a pet waste composter is a great way to manage your pet’s waste and save room in our landfills. Compost Away! Last night 28 pet owners came out to EcoHouse to learn about composting their pet’s waste. With a combined number of 30 dogs, this group will keep 3 650 pounds of dog waste out of landfills and waterways every single year! What a great step for our community, and for our environment. Thanks again to everyone who came out. We had a blast! Remember to install your composter at least two metres away from any food gardens or food composters, and, keep it out of direct sunlight if possible. Add pet waste every day, water once a week, and septic starter once a month for best results. You can also add leaves or shredded paper periodically. Every time it rains, runoff contaminated with dog waste finds it way into Hamilton Harbour. Using a pet waste composter protects water quality. For more information on stormwater and pet waste, go to http://www.slowrain.ca. How Many Garbage Bags Can I Put Out Right Now in Hamilton? Please note that from April 2012- March 2013 your home calendar and those of our clients are similar but specific to their addresses. Please note that on one day per month your home and everyone else’s has a 3 container limit – the other pick up days are 1 container limit. You still get 3 containers at New years, Victoria Day and Thanksgiving. Therefore in this garbage year you get 15 days when you can put out up to 3 containers of residual waste. Starting in April 2013 there will be a bag ‘tag’ system coming into play where households will get a bunch of tags to put on their waste so they can put out more than 1 bag per week on any week – but this won’t start til April 2013. Hamilton: Winter’s waning means deep doggy-doo deposits are suddenly surfacing. Every time it rains, runoff contaminated with pet waste finds its way into Hamilton Harbour. Using a pet waste composter protects water quality in the harbour and other watersheds, and saves valuable space in landfills. Back by popular demand, Green Venture is hosting two free pet waste composting workshops this April at EcoHouse (22 Veevers Drive, Hamilton). Participants will learn why to use, how to build, and how to maintain a pet waste composter. Everyone will leave the workshop with a pet waste composter in hand. Workshops are scheduled for Wednesday April 11, 6:30-8:00 pm and Saturday April 28, 10:00-11:30 am. For more information, or to register for a workshop, please call 905-540-8787 ext. 114, or email water@greenventure.ca. Spaces are limited and will fill up quickly. Participants must register in advance. Green Venture is a community-based non-profit organization committed to helping residents live more sustainably at home, at work, and in their daily lives. Funding for these workshops is generously provided by the Ontario Trillium Foundation and the RBC Blue Water Project. 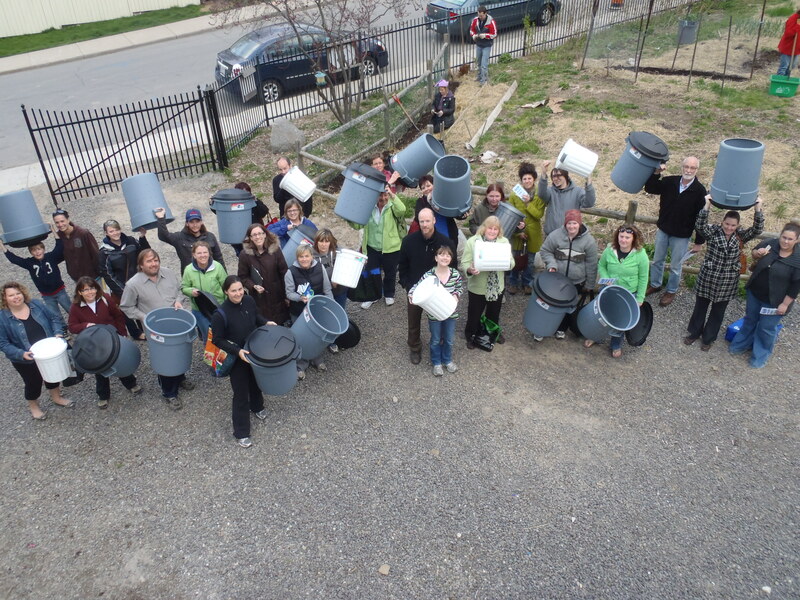 Pet Waste Composters a Great Success! On Sunday July 10, over 20 Hamilton residents came to EcoHouse to learn how to better dispose of their pet’s waste. Participants worked hard to make and decorate their new doggy septic systems. We can’t wait to see the pictures when they are installed back at home! Home installation is easy. Just dig a hole, add some rocks, and insert your composter. It should be almost completely flush with the ground, or sit just a few inches up. Each composter diverts approximately 122 pounds of waste per year (from landfills and waterways). The collective impact of this workshop is a diversion of 2 440 pounds of waste per year! Pet waste will now decompose and return to the soil, where it belongs. Kudos to all who participated. You are making an amazing step for our environment. Contact Kathryn at Green Venture if you are interested in attending a future workshop. 12 000 Pounds of Dog Waste… Every Day! There are 36 000 licensed dogs in the City of Hamilton (estimates say there could be up to 90 000 including non-licensed dogs). Since the average dog produces 1/3 of a pound of waste per day, we are dealing with 12 000 – 30 000 pounds of dog waste every single day just in Hamilton. You can imagine how much space that would take up in landfills. Pet waste is an increasing concern in urban areas. Most residents aren’t quite sure what to do with it, so it ends up in the trash. Municipalities generally suggest you either flush it down the toilet or double bag it and put it in the garbage. Some municipalities (not all) do accept this in the green bin. But why not go even further, and compost your pet’s waste at home? Green Venture is hosting a hands-on pet waste composter workshop. There are only 2 spaces left! Email water@greenventure.ca for more information. If you run into trouble, give Green Venture a call or visit us at EcoHouse. For more information on the effects of stormwater runoff on our environment, visit slowrain.ca. Summertime is Eco-friendly Party Time! June 21st marks the first day of summer and the beginning of a season of barbeques, garden parties and late evenings spent on the patio with friends. Green Venture has received a few questions lately about how we can be environmentally friendly when hosting a get-together. Here is the GV Guide to Eco-friendly Summer Parties! Print your invitations on recycled paper or eliminate paper waste completely by sending your invitations electronically by e-mail or using a website such as Smilebox. Attach Hamilton biking and transit maps to invitations, or encourage your guests to arrange carpools to cut back on carbon emissions. Reduce unnecessary waste by asking guests to make a charitable donation or forego the gifts altogether. Alternatively, creating a gift registry ensures you only receive things you truly need. Re-gifting items you don’t have a use for is also a very environmentally-friendly practice! Forget one-use paper streamers and balloons! Head outdoors and let the beauty of nature be the centrepiece of your party. Invest in flowering native perennials for your garden or find a pretty bunch of cut flowers at a market. Try hanging energy-efficient LED Christmas lights to provide light for celebrations that go on long into the night. Stock up for your next event at a local farmers’ market. Buying local and in-season produce reduces the number of kilometres driven (and the associated pollution) to get the food from the farm to your table. Meat production is very water and energy intensive, so reducing or eliminating meat at your gathering will help preserve valuable resources. For delicious vegetarian recipes that even my carnivorous teenage brother enjoys, visit allrecipes.com‘s veg section. If you’re still hungry, check out foodgawker. When it comes to serving your guests, my recommendation is to use your regular dishes and utensils. They are reusable (no waste) and can be cleaned efficiently in a (fully-loaded) dishwasher. However, I understand that for large parties and in other circumstances, using your own dishes is not possible. First, consider asking your guests to bring their own plates and cutlery. If you can fit it into your budget, using rented plates and cutlery is as environmentally-friendly as providing your own dishes and many companies will even do the washing. If you must use disposable dishes, avoid Styrofoam. Although it is accepted in containers recycling, any plates or cups that accidentally end up in the trash will never break down. There have also been concerns about the effects of Styrofoam on human health. Paper dishes require a lot of water to produce, but a benefit is that they are accepted in green bins in Hamilton. Look for the highest recycled content and chlorine-free processing when purchasing. This logo indicates that the material will degrade in industrial composting systems, such as Hamilton’s. Unfortunately, all compostable dishes on the market right now will not degrade quickly enough to meet this standard. To maintain the quality of the city’s compost, compostable dishes must be excluded. The city is currently looking into alternative composting methods to break down these items faster. It is important to remember though, that compostable and biodegradable products will break down in landfills too, so they are definitely a better choice than Styrofoam. Make it easy for your guests to put their waste in the right place. Have a green bin, containers recycling, paper recycling and a garbage can in each room/space where guests will be. This is called precycling. You may also want to put out a separate container for beer bottles or other containers that you will be returning for refund. Keep these tips in mind when planning your next party to keep your guests and our planet happy!